Four coins appeared in a box on a computer screen. Hans Glocker, a Sanford middle school student with autism, calculated the coins’ total, then chose the right value out of three listed. A cascade of bubbles appeared on the screen, making plinking sounds as they popped. The special education teachers in the room ooooohed. The coin activity looked like any ordinary computer math game, but its images, sounds and reinforcers make academic content accessible to a kid like Hans in a way a pen and paper never will be. “I can’t stand up here and teach from a textbook,” said MacDonald. “I would lose everybody in about ten minutes. SMART boards, iPads and other techy devices are creeping into classrooms around Minnesota. While some argue that tech-heavy teaching is the future, others question whether technology actually adds value to instruction. Some wonder if the investment required to buy technology is balanced by academic gains in students. 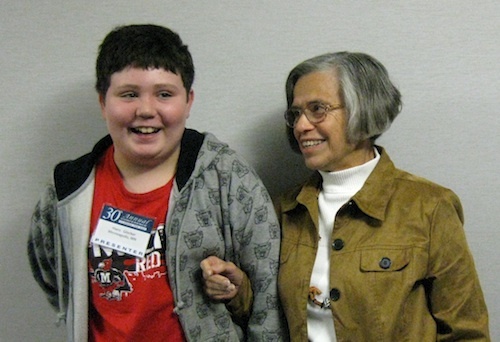 District autism program facilitator Kathy Healy, Sanford middle school autism teacher Janet MacDonald, and her student Hans described their experience with Vizzle at the Closing the Gap assistive technology conference in Bloomington Wednesday. Vizzle is visual learning software. It allows teachers to create lessons incorporating sounds and images that keep the attention of students with autism, who may be easily distracted or who struggle to comprehend lessons delivered by traditional means. In Minneapolis, students with developmental and cognitive disabilities also use the program. MacDonald is able to modify a single activity to meet the needs of her seven students who have varying levels of autism. For students who get distracted by red “x’s,” she gets rid of the red. For students who need a familiar voice to guide them through an activity, MacDonald can replace a computerized voice with her own. Cloud technology allows the program to work on any device. Teachers can access a library of lessons created by other teachers from around the country. Likewise, parents can access lessons and activities at home. Teachers communicate with parents via a messaging system. In an age where data is the supreme decision-maker, one of Vizzle’s most attractive selling points is that it tracks students’ progress on lessons. An ascending green line tells Hans’ parents and his teacher that he is making steady growth. Last fall 10 Minneapolis teachers ran a trial with Vizzle, paid for by a one-year grant from its parent company Monarch Teaching Technology. Positive reviews convinced the district to invest in licenses for 80 teachers to use the program for three years. “We’re totally blown away by [Vizzle],” said Healy. Healy was conscious of potential pitfalls with the new program. She knew teachers were tired of short-term initiatives backed by half-hearted trainings and flimsy support systems from the district. She set out to build robust reinforcements for Vizzle. After an all-day Saturday training, the district began hosting “Thursdays with Vizzle” every week. Teachers share what they’re doing with the program, and the district describes ways that Vizzle can be used in various subject areas. The district encouraged MacDonald to work on Vizzle with her Professional Learning Community, which is a group of teachers organized by common goals who meet regularly to collaborate on their work. The steady feedback kept teachers using the program. During morning meetings, MacDonald sometimes shows a Vizzle lesson about bus safety. An image on the screen shows a boy buckling his seat belt. The image reinforces a lesson that Hans is working on right now. Remembering to buckle his own seat belt is a step towards Hans being able to look after his own safety. Now Hans can work independently on schoolwork while his parents make dinner. It gives them a break from having to monitor him constantly.